Surely there's more than one way to get to heaven? Bestselling author Andy Stanley addresses this popular belief held even among Christians. But believing that all good people go to heaven raises major problems, Stanley reveals. Is goodness not rewarded, then? Is Christianity not fair? Maybe not, he says. Readers will find out why Jesus taught that goodness is not even a requirement to enter heaven - and why Christianity is beyond fair. Andy Stanley leads believers and skeptics alike to a grateful awareness of God's enormous grace and mercy. 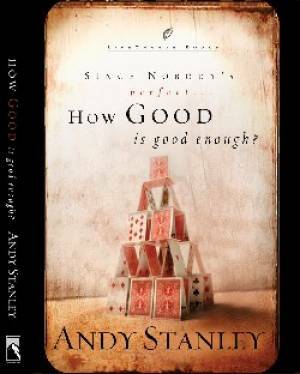 How Good Is Good Enough by Andy Stanley was published by Multnomah Publishers in February 2004 and is our 7490th best seller. The ISBN for How Good Is Good Enough is 9781590523889. Be the first to review How Good Is Good Enough! Got a question? No problem! Just click here to ask us about How Good Is Good Enough.